– Julien and Virginie, your farmers. To subscribe to the subsidized baskets, contact your farmers and the Roulant team by email. Community Supported Agriculture (CSA) is based on the mutually beneficial relationship between you and your farmer. By paying for your weekly share of the harvest at the beginning of the season, farmers can purchase seed, materials and provide a fair wage for their employees. 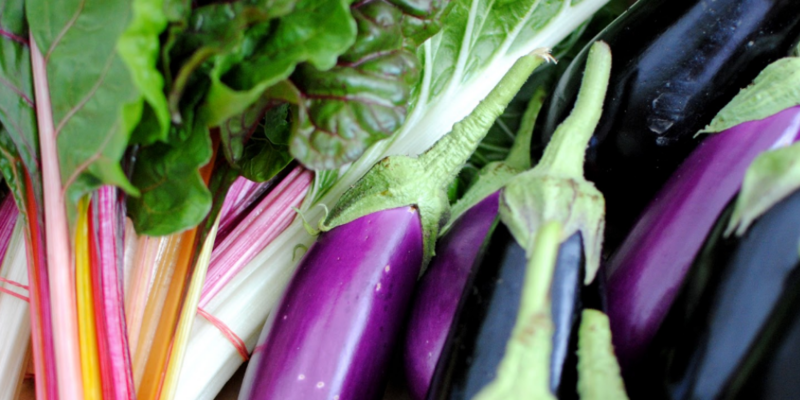 In return, farmers commit to growing a diversity of certified organic vegetables for farm members! To increase accessibility to our CSA over different income brackets, we created a solidarity model. Farm members pay $ 9.00/ basket for their share and this surplus goes towards subsidized CSA shares for low-income individuals and families, and increased organic produce for our meal-on-wheels program. A tax receipt will be made out for farm subscribers registered for the regular Baskets. 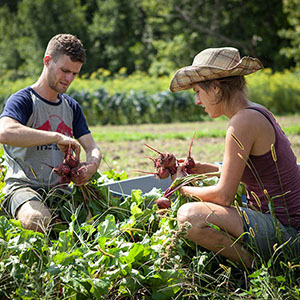 Santropol Roulant’s farm is part of the Family Farmers Network, also called Le Réseau des Fermiers de Famille, which is a network of over 100 organic farms in Quebec. Together we support local, organic and sustainable agriculture that is rooted in the community and connected to its clients. 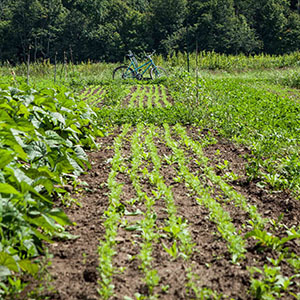 The vegetables in our basket are certified organic by Ecocert Canada and come almost exclusively from our farm in Senneville. The variety changes throughout the season, and baskets are always overflowing with freshness and diversity of produce. What are the sizes of baskets that you offer? We offer one single size, typically with 8 to 12 vegetables. Great for a family of 4 if bought weekly or family of 2 if bought bi-weekly. Yes, in up to 3 installments spread across the season. What are the solidarity or subsidized baskets? The solidarity baskets are our way to make organic vegetable baskets affordable to all. We add a small, tax-receptable contribution to our regular baskets so that they subsidize 20% of our clients. Our solidarity clients can benefit from a discount of 20% or 40% from our regular price of $26. How do I qualify for a subsidized solidarity basket? What if I am away for a week? You are allocated one basket which you move to the end of the season. Limited to only 1 basket. The first delivery begins on June 13th for weekly and bi-weekly Group A clients; it begins on June 27th for bi-weekly Group B. When can I pick up my basket? The baskets are available to pickup on Thursday from exactly 4pm to 7pm. Do you offer bulk ordering options? 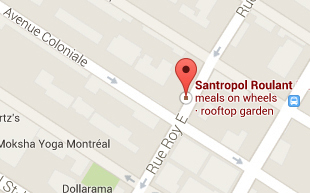 Contact us at ferme@santropolroulant.org to find out more.